This map illustrates satellite-detected areas of landslide damage in the Gardabani District of Kvemo Kartli, Georgia. Following flash floods in the region on 14 June 2014, a landslide on the Vere River near the village of Akhaldaba damaged several road sections in the area. 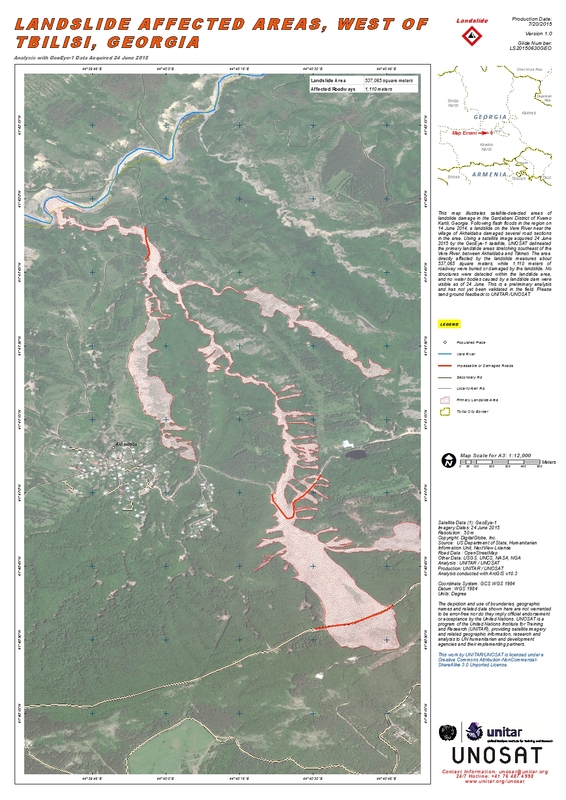 Using a satellite image acquired 24 June 2015 by the GeoEye-1 satellite, UNOSAT delineated the primary landslide areas stretching southeast of the Vere River, between Akhaldaba and Tskneti. The area directly affected by the landslide measures about 537,065 square meters, while 1,110 meters of roadway were buried or damaged by the landslide. No structures were detected within the landslide area, and no water bodies caused by a landslide dam were visible as of 24 June. This is a preliminary analysis and has not yet been validated in the field. Please send ground feedback to UNITAR /UNOSAT.